Our site is about the size of six full sized allotments and approx 2000 square metres. 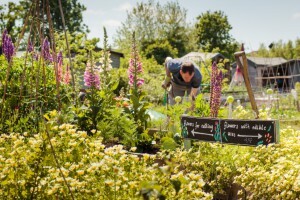 We are based at the bottom of a large allotment site with about 250 plotholders. The land belongs to Bristol City Council but has been run by an independent allotment association – Horfield and District Allotment Association for over 80 years. 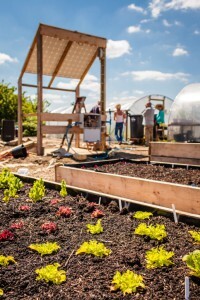 We’ve got over 40 raised beds of different sizes and grow vegetables and flowers. A large bed for soft fruit, a massive big manky mound left over from the building work that we use for growing willow, and a edible forest based on permaculture principles. 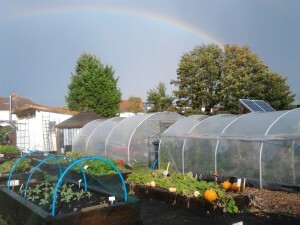 We have two poly tunnels which provide food all year round. And nearly finished is our White House – the strawbale building which is lovely and cool in summer and cosy when the woodburning stove is on.